I like the choice they've made with the stats, but I'm a little upset with the model. I get the eye patch for depth perception, but why the earrings? I feel like I'm trying to be a gangster if I'm wearing this helm. Might be the straight-up worst-looking helm I've ever seen. 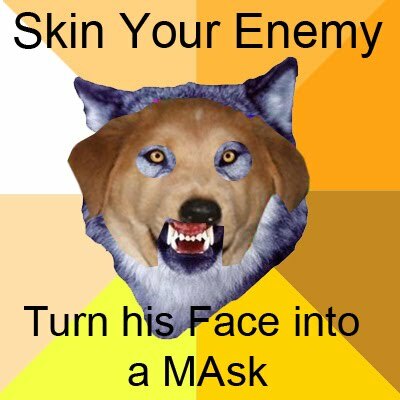 SKIN YOUR ENEMY. TURN HIS FACE INTO A MASK. I don't get why you guys don't like this helm, it looks badass on most races. If you're in human form on a worgen it looks really bad though, you still have a worgen face and the helm is huge lol. Stupidest helmet since hunter T11. One day we'll have a nice, reserved, hunter-looking thing to wear. Until then, Show Helm is off. Am I the only one to think this looks #$%^ing badass? Who cares how it look. You sounds like sissys. If you dont like it dont ware it. We all know hunters haven't had a good looking tier set since BC. I gave up hoping Blizzard's devs would start giving a crap with this content patch. The worst looking hunter helm since Beaststalker and it's look-alikes, which is kind of shame, sice the rest of the set is really nice. Why, Blizz, why...? Transmogr. tool is really of need here. Hunters an Heads an or skulls......WHY BLIZZ Why must you make Us suffer with Hideous Helms! this is 1 reason I Like Transmog. As of this posting I checked with Magatha Silverton and the Flamewaker's Headguard cost 76G 27S 20C you can not turn in the Helm of the Fiery Protector. The Heroic version can still be bought with the Crown of the Fiery Protector.